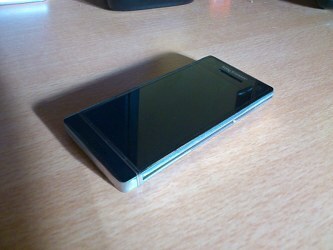 Sony Ericsson is really having a hard time keeping their Xperia Arc HD smartphone under wraps. Their upcoming flagship droid broke loose again and appeared on a couple of live shots, confirming some of its specs in the process. The smartphone codenamed Nozomi, will sport a dual-core CPU, clocked at 1.5 GHz, a 12 megapixel camera and a 4.3" 720p screen. It will offer 1GB of RAM and 32 GB of storage, but there will be no microSD card slot, so you won't be able to expand that. A nicely sounding 1750 mAh battery will power the Sony Ericsson Xperia Arc HD. According to the source of one of the two leaked images, the Arc HD should make its official debut at CES 2012, which takes place from January 10 to January 13 next year. With such a sleek design and a specs sheet like that, the Sony Ericsson Xperia Arc HD will certainly be one of the hottest devices of 2012. The only problem might be that the flagship will bring a dual-core CPU to a quad-core party, but we are yet to see about that. Special thanks to Alfred Sung and Alex Thrystan for sending the links in. How cost it will be in Bangladesh ?? Will it have LTE and come on at&t? If so I want one, just cause of the camera. If no LTE or at&t i'll go with the galaxy note. I hope to have a xenon flash!